The United States maritime transportation system consists of over 25,000 miles of waterways, ports, and other navigable waters. It is the backbone for moving goods, services, and people throughout the U.S. and abroad. More than 95% of all U.S. trade involves some form of maritime transport, and ships move $1.4 trillion worth of products in and out of U.S. ports every year. Ship operators across the globe rely on accurate information about ocean conditions, including water levels, currents, and winds, so they can plan efficient shipping routes, maximize cargo onboard, and safely navigate narrow shipping lanes. PORTS® is an integrated system of sensors concentrated in seaports that provide commercial vessel operators with accurate and reliable real-time information about environmental conditions. 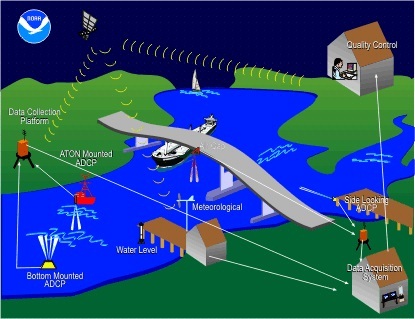 PORTS® measures and disseminates observations, predictions and nowcast/forecasts for water levels, currents, bridge air gap, salinity and meteorological parameters (e.g., winds, waves, atmospheric pressure, visibility, air and water temperatures). This data improves navigation safety by reducing groundings and collisions by up to 60% for commercial and recreational vessels and preventing oil spills. It can also increase shipping efficiency by reducing transit delays and allowing mariners to optimize their cargo load. Mariners need these data, tools, and services to make critical navigation decisions, especially as significantly larger vessels transit through U.S. ports because of the Panama Canal expansion. MyPORTS - An application designed to let you customize your own PORTS® page (select what data you want to see from any PORTS®). An example of the sensors that make up the Physical Oceanographic Real-Time System (PORTS®).